Taking a break from tradition, Professional Manager, the Postgraduate Institute of Marketing’s (PIM) management journal publishes a special commemorative issue in honour of eminent Economist, the late Dr. Saman Kelegama. 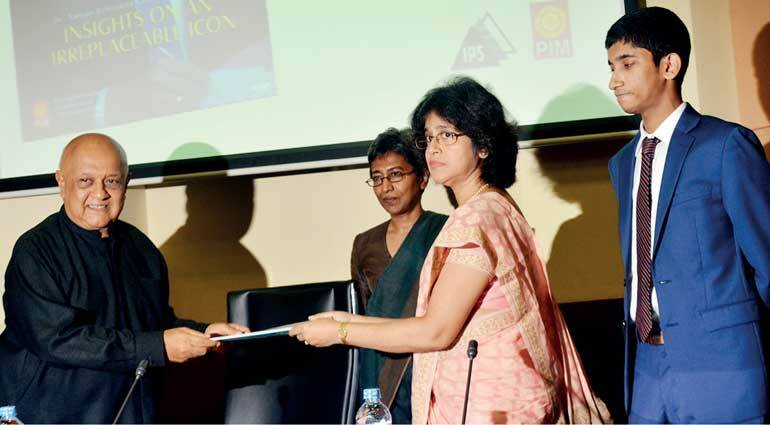 This 14th edition of Professional Manager is devoted to Dr. Kelegama and was launched at the Institute of Policy Studies of Sri Lanka on Tuesday, with its first copy handed over to Sririmavo Kelegama by the magazine’s Associate Editor, Dr. Wickrema Weerasooria. Aptly titled ‘Insights on an Irreplaceable Icon’, this issue contains 25 articles dedicated to Dr. Kelegama, devised by the likes of Dr. Razeen Sally, W.A. Wijewardena, Prof. Ajantha Dharmasiri, Dr. Ganeshan Wignaraja, Sriyani Hulugalle, Deshal De Mel, Dr. Dushni Weerakoon and more. A stalwart of the Sri Lanka Association of Economists and one of its Presidents, Dr. Saman Kelegama, was Executive Director at the Institute of Policy Studies (IPS) from 1995 and a member of the Governing Boards of the South Asia Centre for Policy Studies in Nepal and the Postgraduate Institute of Management, University of Sri Jayewardenepura. In addition to numerous stints on government boards and committees, Dr. Kelegama also served as Chairman of Singer Sri Lanka PLC before his untimely demise in June last year. In his appreciation, IPS Chairman Dr. Razeen Sally, states that the late Dr. Kelegama was Sri Lanka’s leading home-based trade economist and recognised the former Executive Director’s passion to nurture young scholars through the IPS fold, who now contribute with sterling work in government service and the private sector. “IPS can do most to honour Saman by making the quality and dissemination of its policy research even better. IPS’s short and medium-term research agenda will continue to focus on Sri Lanka’s reform priorities,” he adds. Speaking at the launch event, Dr. Dushni Weerakoon, who succeeded Dr. Kelegama as Executive Director at IPS, reveals that the Dr. Saman Kelegama Research Grant will be launched tomorrow 6 April. This would be followed by an International Economic Conference in his honour in June this year, bringing together eminent economists from all parts of the world. She added that Dr. Kelegama firmly believed good quality research formed the basis for evidence-based policymaking, and that he worked tirelessly to foster a public debate on issues of national economic importance and regional issues. IPS has now reassembled themselves as team and are continuing the work that it plans to carry out through the year and into the future, she states. In her contribution to Professional Manager, Dr. Weerakoon recognises her predecessor’s contribution over two decades to build IPS into an institution of repute across the region. “Today the Institute stands as a well-recognised regional centre of research excellence, with a global outreach. The policy inputs sought from the IPS, the citation of its work in Sri Lanka’s socio-economic policy discourse and its international networks are testament to how far the Institute has come. Under his leadership, the IPS became a living growing entity, full of opportunities for researchers hungry for new experiences”.